Matthew Grubb obtained his undergraduate, Master’s and doctoral degrees all from the University of Oxford in the UK, where his DPhil with Ian Thompson investigated form, function and development in the mouse visual thalamus. Sorely in need of a change of scenery, he then obtained a Marie-Curie IntraEuropean fellowship to undertake his first post-doc at the Institut Pasteur in Paris, France, where his work with Pierre-Marie Lledo focused on the maturation of the first synapse in the olfactory system in both development and adult neurogenesis. 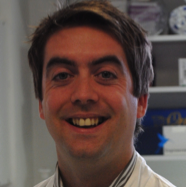 Returning to the UK for a second post-doc, Matthew worked with Juan Burrone at the MRC Centre for Developmental Neurobiology, King’s College London to characterise optogenetic means of controlling neuronal activity, as well as novel forms of activity-dependent plasticity at the axon initial segment (AIS). Starting in 2010, a Research Career Development Fellowship from the Wellcome Trust then enabled him to set up his own independent laboratory at the MRC Centre. Over the past five years his small but dedicated team has continued to investigate plasticity at the AIS, but has focused mainly on activity-dependent alterations in dopaminergic neurons of the olfactory bulb, where their groundwork in dissociated cultures has been able to guide us towards some fascinating forms of experience-dependent plasticity in vivo. My laboratory investigates plasticity in the maturing brain – how neurons and circuits are shaped by experience throughout life. We want to understand how different cellular mechanisms of plasticity can combine to produce functional changes in individual neurons, and how these single-cell effects go on to affect information processing in neuronal circuits, and ultimately whole-organism behaviour. We address these key questions in basic neuroscience by studying a model system with unique and extremely useful properties: dopaminergic neurons of the olfactory bulb. These cells are exceptionally plastic, to the point of whole-cell replacement throughout life via adult neurogenesis, and we have recently found that they undergo multiple cellular forms of activity-dependent plasticity both in vitro and in vivo. Using a range of neuroanatomical and electrophysiological techniques, along with experience-dependent and cell-autonomous means of manipulating neuronal activity, we aim to fully characterise plasticity in these cells as they mature in the developing and adult brain, and to uncover how this plasticity can affect both information processing in the olfactory system, and whole-animal sensory behaviour.